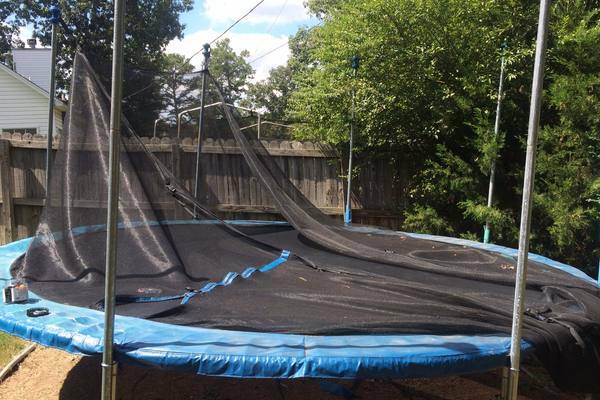 When we purchase a trampoline, the last thing many of us consider is that it may one day need repairing. However, if they are used frequently, even the highest-quality models can and do develop tears. The most common areas for tearing are the jump mat and the net. However, before you spend your hard-earned money on costly replacement parts, you should know that many small repairs can be carried out yourself. Best of all, you don't need to be a DIY expert to fix your own trampoline! Just a little know-how and the right equipment are all you need. So, how do you repair a trampoline? The key things you'll need to know are how to carry out a trampoline patch and a trampoline net repair. Don't worry, because this article will tell you everything you need to know to get you well on your way. First of all, it's important to know that some tears just can't be fixed at home. If the tear is any bigger than 2 inches across, then it is too dangerous to continue using the trampoline and cannot be fixed. You will need to buy a whole new mat. It's best to avoid allowing these big tears to develop in the first place. If you check your trampoline mat over thoroughly and at regular intervals, you'll spot any small tears before they get any worse. If you notice any kind of damage, always fix it before you let your kids back on the trampoline. 1. Remove the trampoline mat from the frame. 2. Inside your repair kit that came with the trampoline, there will be patches of replacement material. The instructions will tell you which stitch to use to carry out your repair. If your trampoline didn't come with a repair kit, or if you've lost it, you can buy replacement ones online. 3. Using a sewing machine, sew around the edge of the patch. You will need to go around a few times to make sure it is secure, and then trim any extra material. Now, you can get back to bouncing! If you don't have a sewing machine handy, or don't have the confidence to sew on a new patch, then trampoline repair glue may be the answer to your problem. Just like the repair kit, you can pick up repair glue easily from Amazon or another online supplier. Instead of sewing around the edge of the patch, you simply glue it down instead. Don't forget, this will need to be allowed to dry for at least a day before using your trampoline again. As many reviewers have pointed out, this is likely to leave a lumpy area where the glue has been applied. If you want a finish that's as near-perfect as possible, then sew-on patches re the way to go. If you have a broken spring, then you'll need to replace the spring in question. Luckily most trampolines come with a nifty tool to make this job relatively easy, aptly names a Trampoline Spring Tool! If not, you can purchase these online too. Here are some things to bear in mind before you attempt to replace a spring. Make sure you remove the mat from the trampoline before replacing the spring. Otherwise, the springs with be tense, and you'll end up with an unfortunate 'pinging' situation! Never, ever use springs intended for anything other than a trampoline spring for the job! Remember, these springs are designed to hold your body weight. There are two main methods for repairing a trampoline safety enclosure, and which you choose depends on your budget, the finish you want and how much work you're prepared to put in. These are patch repair and duct tape repair. 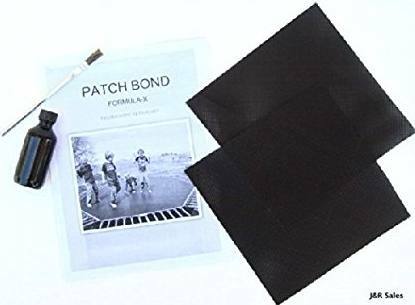 If you go for a patch repair, you will get a better finish but it will require mat repair patches, thick yarn like fishing yarn, and a sewing machine. A duct tape repair will be quicker and easier, but will look more obvious. 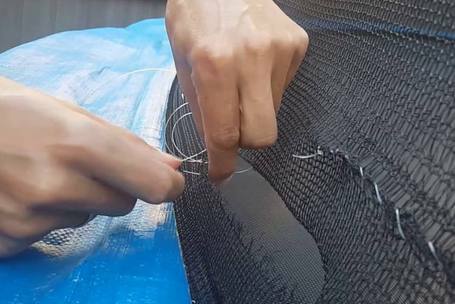 Remember, you can only repair a net to an acceptable degree of safety if the rip is small. Big rips will require you to buy a new net. First, remove the net from the trampoline. You will need two pieces of patching, one for the front and one for the back. 'Sandwich' the tear between the two pieces, and stitch throughly along the edges of the patches with heavy-duty yarn. This will either need to be done by hand or with a sewing machine that can cope with this type of yarn. Again, remove the net first. You will need to apply duct tape to both sides of the tear, both front and back. Press down very firmly to ensure it is properly adhered. You will most likely need several layers to make your repair secure. 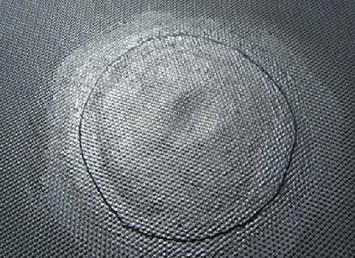 Hopefully, you now feel confident to carry out your own trampoline patch and trampoline net repair. 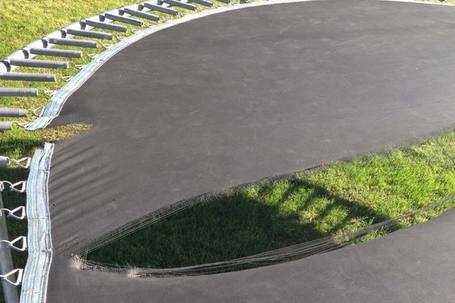 Remember, regular inspection of your trampoline can catch small areas of damage before they become too big to repair. However, if the tear is large or you are in any doubt, then it's safest to opt for a replacement. That way, you have complete peace of mind that your trampoline is safe for your family to use.